The Shark Scientist features Dr. Greg Skomal, a biologist studying great white sharks in Chatham, MA (not far from where the setting of Jaws). Organized chronologically by day, the book follows the work of Skomal and his crew one summer as they tag sharks off the coast of Cape Cod. In her signature narrative style, Montgomery eloquently blends dialogue, description and facts to paint a vivid picture for readers. "Look at those rocks!" says Keith, marveling at what looks like hundreds of dark boulders on the beach. Ellenbogen's impressive photographs capture sharks underwater, divers in submersible cages, and Skomal on his boat tagging sharks. Readers will take a way a new appreciation of sharks and an understanding of why humans need to save them. 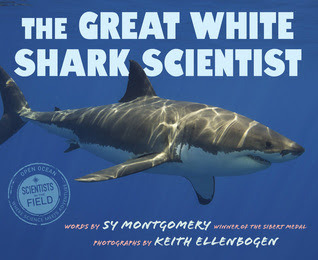 The Great White Shark Scientist is a recommended purchase for schools and libraries. It would make an exciting and informative nonfiction read aloud for grades 4 and up. Visit the publisher's site to download a discussion guide. Cannot wait to read this! I LOVE all of Sy Montgomery's work!! Two of my favorite Scientist in the Field books of hers are The Octopus Scientist and Chasing Cheetahs. Her Birdology is wonderful too, and I also enjoyed The Soul of an Octopus. We are addicted to shark week!!! And to top it off - danger signs were posted at our local beach about a great white sighting last week so things are super exciting around here. This book looks like one we need to read. Off to the beach with binoculars to see if we can sight a shark. Your scientific experiment technical resolve ideas wonderful thanks for share it research transcription services .